The 61st Annual Grammy Awards aired on Sunday, February 10 and were hosted by 15-time Grammy recipient Alicia Keys. The awards show is one of the most anticipated events of the year as music artists are recognized by the Recording Academy for their contributions to the industry. As one of the most exclusive events in the music industry, attendees make sure to go all out with their attire and plan ahead of time. That being said, the celebs at the Grammys decided to bring their best (or their worst) at this year's ceremony. Call the fashion police, because here are our picks for each category! This isn't the first time the 27-year-old singer has made a political statement on the red carpet. In 2017, she wore a "Make America Great Again" dress and in 2018, she wore a pro-life gown, both of which were equally as provocative as this ensemble. For this year's awards, she wore a dress inspired by President Trump's desire to "build the wall," with white brick and barbed wire detailing. This look is, as some would say, wack. Not only was the coat floor length, but it consisted of multicolored feathers on top of an extremely busy gown. To top it all off, the rapper donned a mixture of pink, yellow and orange eyeshadow. The on-air correspondant for Access Online arrived at the red carpet in a Steven Khalil midi dress. The baroque style neckline mixed with metallic lace and a black statement waist design was not the best combination. Singer-songwriter Ashlee Simpson Ross arrived at the red carpet in a Georges Chakra jumpsuit. The idea and style of a beaded sparkly jumpsuit have been seen on the runway a few times this past season. However, the addition of feathers on the torso as well as on the long sleeves took the attention away from the beading and glitz of the jumpsuit. Andrea Echeverry of the Colombian rock band Aterciopelados was obviously inspired by the golden gramophone award. However, it's a bit too much. 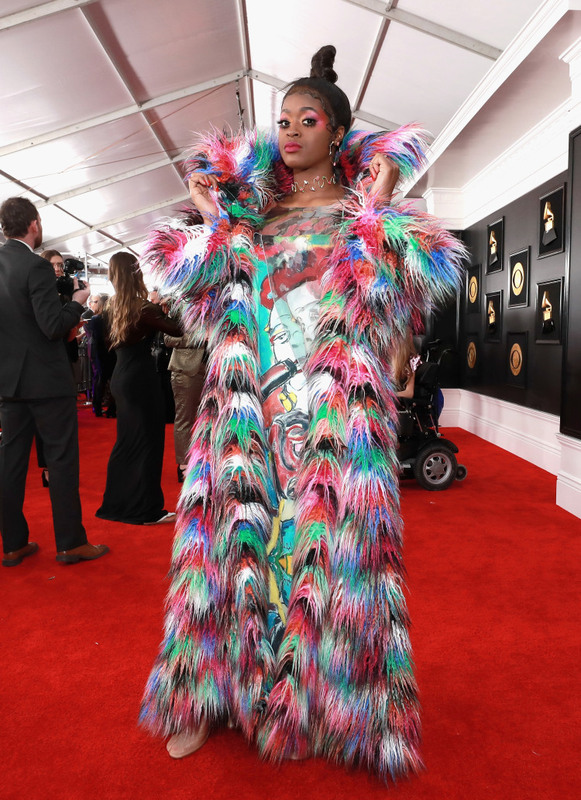 Maybe her goal was to win an award for being the worst dressed. In this case, congratulations! Mr. Bridges' suit was definitely inspired by the wild, wild West, especially in the sense that it's a bit wild. 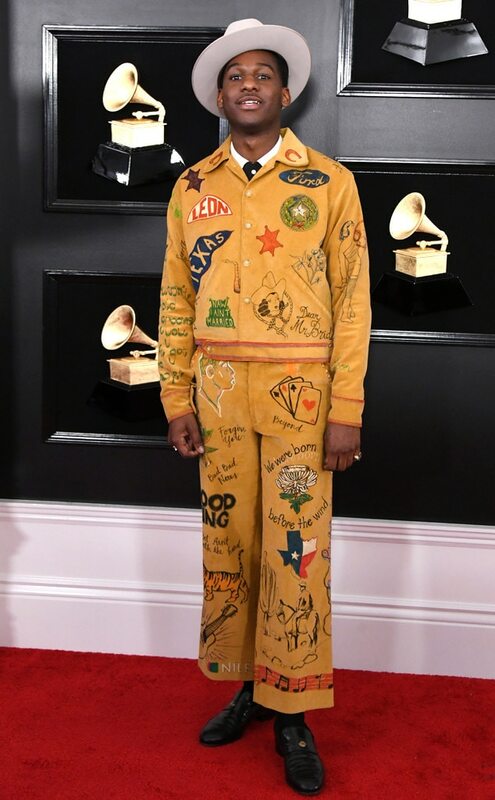 It kind of looks like a third grader scribbled on an expensive velour suit, and for that reason, it made our worst dressed list. After her designer debacle, Best New Artist nominee Bebe Rexha really came to slay and show the designers that refused to dress her size 8 figure what they were missing. Dressed in a deep red Monsoori tulle gown and Guiseppe Zanotti shoes, Bebe stole the show and looked beautiful. Although Shawn Mendes can wear a paper bag and look incredible, he dressed in a classic blue suit paired with a black button-down dress shirt and Chelsea boots for the Grammys red carpet. The shirt is popped a little open for a classic casanova vibe. The now nine-time Grammy winner and leading actress in "A Star is Born" sparkled and shined on the red carpet. Her Celine gown was paired with Tiffany & Co. jewelry and matching silver platforms. Anna Kendrick attended the awards as a presenter but stole the show in her Ralph & Russo blush feathered mini dress. The strapless mini dress fit her perfectly and the high ponytail brought it all together to form a beautiful, elegant and seamless look. 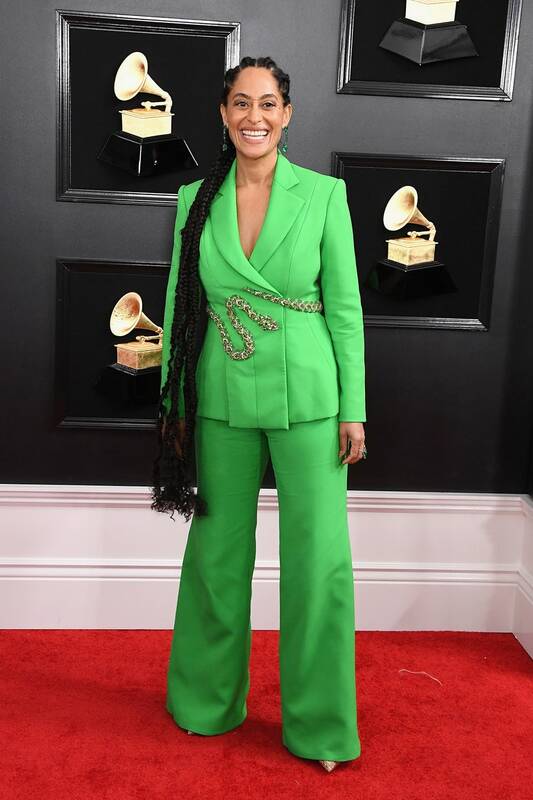 Daughter of legendary singer Diana Ross, Tracee arrived at the red carpet in a green Ralph & Russo power pantsuit. The jeweled snake belt paired with emerald earrings and extremely long hair made her outfit into a full-on vibe. Dua brought complete silver ice queen vibes to the red carpet. Her long train and sparkles definitely made a statement. Not only was her glamour effortless, but timeless too. The train was so glamorous she needed a whole assistant just to hold it for her as she met up with fellow nominees on the red carpet.